Well we're getting over yet another cold. This one was a doozy... Anne Marie and I both had it but are starting to feel better. She's growing so much every day. She's started doing so many new things recently too... biggest change is that she's trying so hard to be mobile... and while she doesn't quite crawl yet, she wiggles, rolls, pivots and generally throws herself around so that she gets where she wants to be. Won't be long before she figures out crawling though... she does the rocking on all fours thing. And she has figured out how to toddle along when she's holding on to her hands... I had one of those "my baby's growing up" attacks the other night when I saw her coming toward me on two feet! We went to the beach last weekend for a long weekend with friends Jeff, Melissa and Sam Tustin. We had a great time and it was very relaxing - except for the colds Anne Marie and I had. She's officially a water baby (in the pool at least). She loved it!! Big smiles and feet kicking! She wasn't sure about the ocean but it was pretty cool so she didn't get the best introduction. I think she'll like it better as the summer wears on. 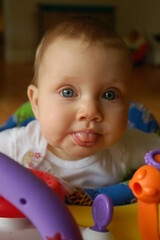 And her seven month photo shoot: Seven Months!